CAIRO Libyan rebels appear to have "summarily executed" scores of fighters loyal to Muammar Qaddafi, and probably the dictator himself, when they overran his hometown a year ago, a human rights group said Wednesday. The report by Human Rights Watch on alleged rebel abuses that followed the October 2011 capture of the city of Sirte in the final major battle of the eight-month civil war is one of the most detailed descriptions of what the group says were war crimes committed by the militias that toppled Qaddafi, and which still play a major role in Libyan politics today. The 50-page report, titled "Death of a Dictator: Bloody Vengeance in Sirte," details the last hours of Qaddafi's life on Oct. 20, 2011, when he tried to flee the besieged city. The longtime leader's convoy was struck by NATO aircraft as it tried to escape and the survivors were attacked by militias from the city of Misrata, who captured and disarmed the dictator and his entourage. Misrata was subjected to a brutal weeks-long siege by Qaddafi's forces that killed hundreds of residents, and fighters from the city became among the regime's most implacable foes. 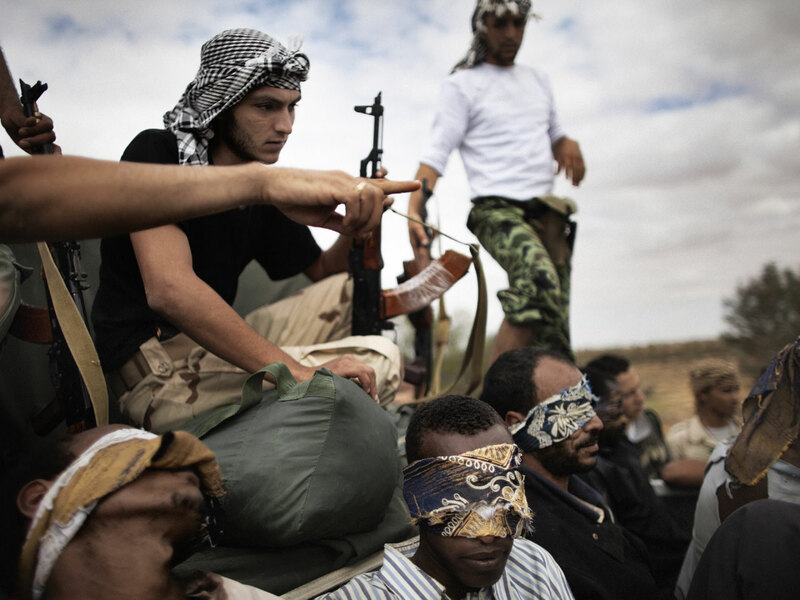 HRW says it seems the Misratans took revenge against their prisoners in Sirte. "The evidence suggests that opposition militias summarily executed at least 66 captured members of Qaddafi's convoy in Sirte," said Peter Bouckaert, emergencies director at Human Rights Watch. The New York-based group's report says that new evidence unearthed in its investigation includes a mobile phone video clip taken by militiamen showing a large number of prisoners from Qaddafi's convoy being cursed and abused by rebels. The remains of least 17 of the detainees in the phone video were later identified in a group of 50 bodies found at Sirte's Mahari hotel, some still with their hands tied behind their back. Human Rights Watch said it used hospital morgue photos to confirm the victims' identities. "Video footage shows that Muammar Qaddafi was captured alive but bleeding heavily from a head wound," the HRW report says. But footage showed that he was "severely beaten by opposition forces, stabbed with a bayonet in his buttocks, causing more injuries, and bleeding. By the time he is filmed being loaded into an ambulance half-naked, he appears lifeless." Bouckaert said the group's "findings call into question the assertion by Libyan authorities that Muammar Qaddafi was killed in crossfire and not after his capture." Qaddafi's son, Muatassim, was also videotaped alive and in captivity, only to have his body turn up at a morgue in Misrata alongside his father's. His hometown, Tawergha, was used as a staging ground by Qaddafi's forces to launch attacks on Misrata, but after rebels broke the siege on Misrata and overran Tawergha, the town's residents fled or were driven out by vengeful rebels. Suleiman al-Fortia, a member of the dissolved National Transitional Council from Misrata, denied that Qaddafi or his loyalists were executed. "We hoped to arrest Qaddafi alive (to try him). All the killings took place in a crossfire," he said. But HRW said, "Under the laws of war, the killing of captured combatants is a war crime, and Libyan civilian and military authorities have an obligation to investigate war crimes and other violations of international humanitarian law." The group released its report days before Libya celebrates "liberation day," the anniversary of Sirte's fall on Oct. 23. Since then, the country's new leaders have heavily depended on former rebel militias to secure cities and protect borders in the absence of a strong national army or other government security forces. Meanwhile, some groups have been implicated in revenge attacks and communal strife, while members of one Islamist militia have been accused of taking part in the attack on the U.S. Consulate in the eastern city Benghazi on Sept. 11 that killed four Americans, including U.S. Ambassador to Libya Chris Stevens. In the aftermath of Stevens' death, popular resentment surged and thousands took to the streets of Benghazi demanding the dismantlement of the militias. The government has taken over some militia headquarters and appointed military officers to run the groups, and designated some "outlawed" and others "tolerated."